Running numbers: 1366 - 1371. Built: February 1934 to lot 286. This pretty class of 0-6-0 pannier tank engines were built to replace the '1392' class for use in dock working. Below the running platform, they were very similar to the '1361' class introduced in 1934 but the main differences were above the running plate with pannier tanks, Belpaire fireboxes, Stephenson valve gear and a one - piece boiler. 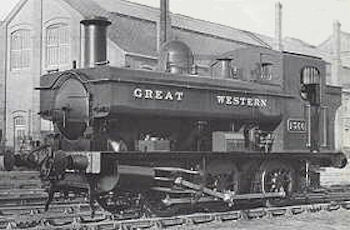 Their initial work involved hauling the the Channel Islands Boat Express through the streets of Weymouth for example, but in their later years many were employed as shunting engines around the Swindon works. Three engines of the class were withdrawn in 1960/1 but those attached to the Wadebridge shed were not disposed of until 1964. Fortunately, one member of the class has been preserved, number 1369.